You will know, dear reader, that it is not my custom to burden you with details of my frail health. But I need to tell you that I felt under the weather in Chianti. You will receive this intelligence, I know, with your usual sympathy. I impart it only so that I can have an opportunity publicly to thank Gianfranco and Gianpaulo – two waiters who showed me great kindness and who went well beyond the call of duty to ensure that I was soon fit and well once more. They work at the Castello di Spaltenna, a feudal hamlet – dating from the 11th century – which is now an hotel of comfort and character. 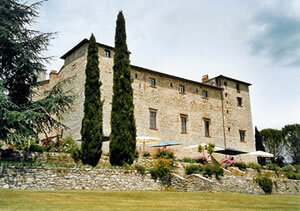 Set among rolling green hills and neighbour to numerous other picturesque castles, the Castello – as you will see from the accompanying pictures – is a handsome pile. It must once have shown a fierce face to the world (it was a castle, after all), but now it appears a model of gentleness and pastoral calm. At its centre is an exquisite little church, still used, I think, for weddings. Within the extensive grounds are tennis courts and swimming pools, the latter both indoor and outdoor. 38 bedrooms are offered. Mine was number 29. 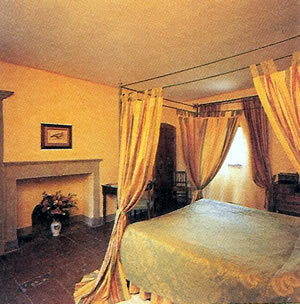 In a single-storied stone building, this was classed as a Deluxe Double and was therefore 270-320 euros a night, bed and breakfast for two, according to season. Of modest size, with rough white walls and a tiled floor, its chief asset (apart from the charming provision of a prie-dieu at the bedside) was the view from the single, shuttered window – over the sloping vineyards and modest hills of what we British now call ‘Chianti-shire’. I would recommend, however, that you spend a little more and secure the increased space of a suite (460-540 euros) or a junior suite (325-380 euros). This same panorama awaited me each morning at breakfast. On a terrace framed by bushes of pink roses, I sat shaded from the sun and tucked into plates of high quality food. When there is a buffet, I like to take my time over assembling a proper repast. In particular, I am always careful to ensure that each bowl has a plate beneath it. A bowl set directly upon the tablecloth is a horror not to be countenanced. So, properly presented, my breakfast comprised crusty bread, bacon, melon, pineapple, croissant and cake. All washed down with pots of Twining’s English Breakfast tea. I must give you one piece of advice about dinner. You must book your table in advance, even if you are staying at the hotel. The Ristorante della Pieve has a high reputation in these parts. I observed several couples being turned away, because tables were simply not available. 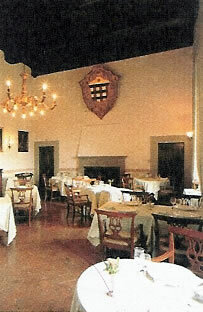 Such popularity is understandable, for the old hall of the Castello makes a handsome dining room. With a single candle flickering on each table, a high ceiling with massive beams and with walls crowded with paintings of long-gone prelates, a certain baronial dignity prevails. I was pleased to observe that many of my fellow diners had made the effort to dress well – although, as usual, mine was the only starched collar to be seen. 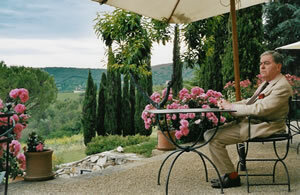 I made it my habit to sit at a table by a window, so that I could allow my gaze to wander out over the vineyards. I knew that the wine list would be interesting, as soon as I spied the Riedel glasses on the table. 300 bottles are offered. Most are from Chianti and most are red. (Francophiles will, however, be relieved to know that 1998 Margaux can be had for 308 euros, and that a half-bottle of 1997 Yquem can enliven their puddings for 245 euros.) The local chianti classico of Gaiole in Chiante is well represented, and includes the 2001 La Cassucia, Castello di Ama, at 135 euros. Of the super Tuscans, 1998 Ornellaia is keenly priced at 115 euros. I relied upon the wine waiter, Gianfranco Nurra, to point me in the direction of some good drinking. (Yes, this is the same Gianfranco who went out of his way to look after me in my illness.) From his recommendations, I will single out one star – a syrah from Florence. A syrah from Florence? Indeed. And a splendid one, too – with an immediate explosion of ripe fruit (mostly black, but with hints of red) upon pouring, luxurious richness in the mouth and a long, lingering aftertaste (Fontodi, Case Via, 2001 – 45 euros). I wish you good health and youthful vigour when you go to Chianti. Such gorgeous scenery promotes nothing less. 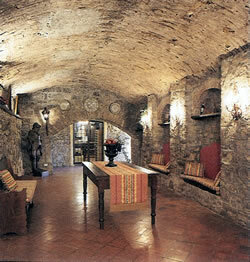 Still, however you are feeling, I know that you will enjoy excellent hospitality at the Castello di Spaltenna. Località Spaltenna 13, 53013 Gaiole in Chianti, Italy.